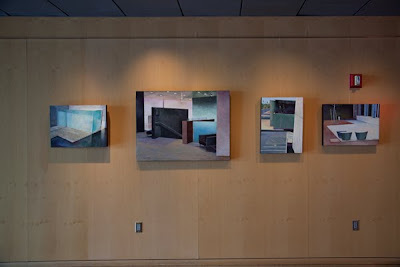 At last...making art full-time: The Show is Up, Now What??? The Show is Up, Now What??? 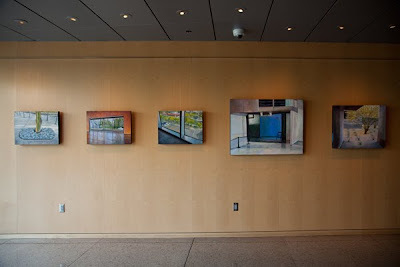 I've been working on a series, Nooks & Crannies, for a year. 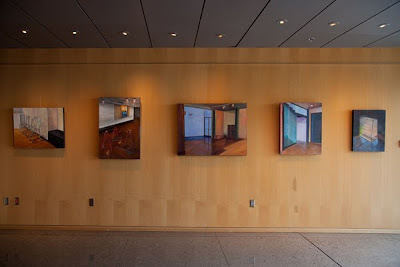 I applied to exhibit at the @Central Gallery at Burton Barr Central Library in downtown Phoenix last December and was offered a solo show in February (or sometime after the new year). I've been focused on this show for many months, with a goal of completing between 18-22 new paintings. That's a lot for me, because I'm a slow worker, and a painting, no matter what the size, usually takes a month or more for me to complete. Above is a view of the entrance to the library, taken by my husband, James Cowlin. I'm lucky to be married to him for so many reasons, one of which is that since he's a professional photographer, I get to be the beneficiary of his talent when I need good pictures. He also puts up with me when I'm cranky, which I am especially when I'm stressed out. Like right now. This photograph is so beautiful, I'm tempted to take a stab at making a painting from it! 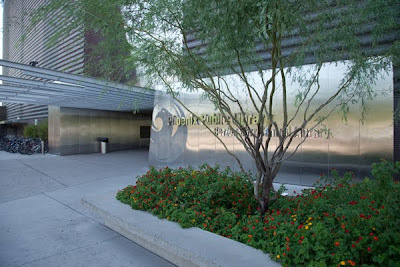 It's another view of the entrance to the library. 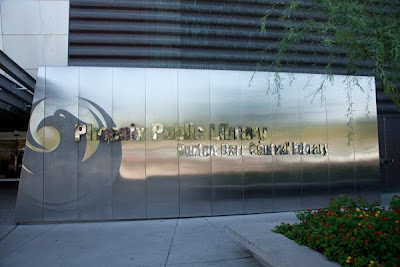 By the way, Burton Barr Central Library is one of my very favorite places in Phoenix. It's worth a visit to enjoy the architecture, both outside and inside. 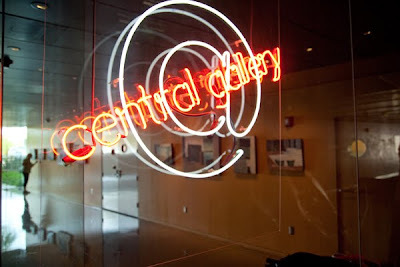 There's always a good show in the gallery, thanks to Prudence Crosswhite, who's the curator of @Central Gallery. 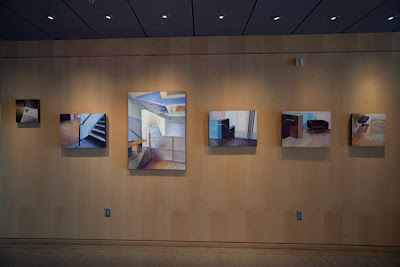 There are a series of cases displaying fine art books on first floor behind the stairway. There's a beautiful reflecting pond. The 5th floor offers fantastic views of the city and is the largest reading room in the country. Not to mention the great collection of books. Here's a shot looking into the gallery. Here's Prudence straightening up a painting. 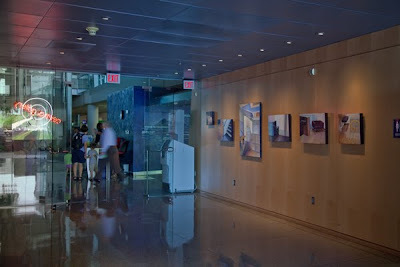 A shot looking out into the lobby area of the library from the gallery. One of the walls, with my work. The little painting on the left is hung high up to make room for my artist statement. Thank you to Alyson Stanfield and her book I'd Rather Be in the Studio. Writing an artist statement is not so much fun. It takes a lot of thinking, writing and rewriting. It's never really finished. I feel like I took a pretty good stab at the newest version for this show. So, it's up. 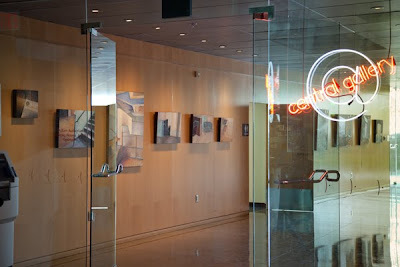 There are 2 receptions, coinciding with 2 First Fridays. One is September 4, this Friday. The other is October 2. I'll be at both. After driving to Phoenix and back (2 hrs each way) yesterday with Jim to deliver and install the work, I did not get up early. I almost didn't get up at all. I guess you could say I had something of a letdown. I won't even get into my thinking about all that work, and was it worth it and who cares, etc. etc. Anyway, I did roust myself out of bed. And have been busy, busy, busy ever since. There's a lot of mop up to do. For instance, some of my cards have been returned, to I need to update my mailing list. I have new paintings to record in my computer files. I have 5 online galleries to update. Etc. I'm already anxious to get back into my studio. To do what, I'm not sure. Stay tuned while I figure it out! Barbara: The show looks fantastic! Thank you for sending the beautiful postcard, too. I hope to someday see your art in person. Thanks, Alyson. I'd still like to figure out a way to get you to Tucson or Phoenix to do a workshop on of these days! Barbara, This is stunning. Your work, the exhibit, the photographs....I nearly feel like I am there. I do want to see more of your work! Congratulations to you...now go back to that studio! Thank you, Liz. It really does help to be married to a photographer.He does such a good job of reproducing the work and of doing installation shots. You can see the whole show at www.barbaracowlin.visualserver.com. I'll get back into the studio next week. I promise! Thanks for the nudge. it's interesting to read that you're inspired by "spaces with an air of mystery" (obviously, i had a look at your statement). space, interiors in particular, have such an influence on us, more than we realize, i believe. i hope the show was a success. I appreciate your comment on my work. Every once in a while I see something that stops me in my tracks and I just have to paint it. 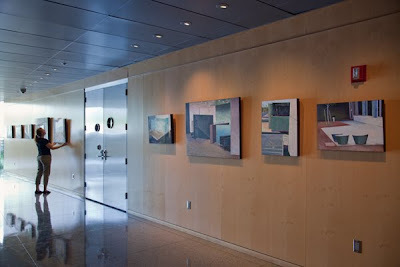 As it happens, the batch in the show is all from interiors at the Phoenix Art Museum. Every time I go there I see something new (aside from the actual art). I'm not sure if the show is successful or not. Guess it depends on what you call a success. It's still up for a few more weeks. My dream was for someone important from the Museum to come by and see the work (after all, it's only a block away from the gallery), but alas, it's probably just a dream. And yes, I did contact people at the museum.